Growing up along the Russian River and coastal redwood forest of Northern California, Travis developed a deep passion for the outdoors. From as far back as he can remember, he’s been exploring the outdoors: swimming, fishing, canoeing, kayaking, swinging from ropes and anything that would get his adrenaline flowing. 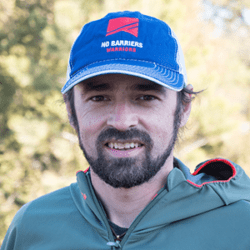 After completing high school, he promptly moved to Truckee, CA and began to teach snowboarding during the winter, and rock climbing & mountain biking in the spring, summer and fall. Eventually moving back home to Sonoma County, CA, he became a carpenter and woodworker as well as a team building and leadership facilitator at a local high ropes course. He continued rock climbing and eventually earned his Wilderness First Responder and AMGA Single Pitch Instructor Certificates. While focusing his energy as a part-time guide, he looks forward to continuing to work with veterans in an experiential learning environment, and helping them discover their inner strengths. Travis is stoked to be a leader with No Barriers.